It’s time once again, girls and boys, for the STEAM Midweek Madness Cyberpunk Sale! Never to be outdone, STEAM is slashing prices once again on so many games this week that it will make your head spin. If you are a PC gamer and you don’t have a STEAM account, I do not know what you are doing with your life. 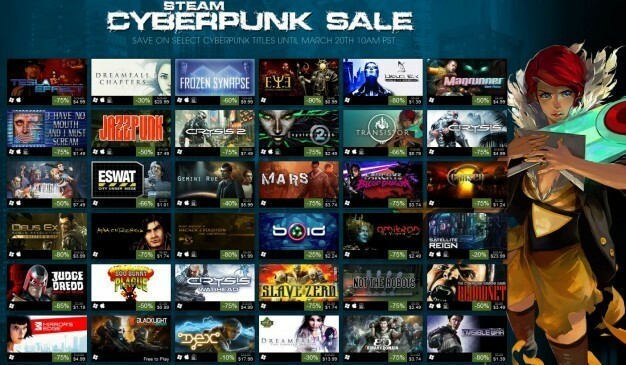 Over 30 cyberpunk titles are priced to move with discounts ranging from 10% to 90% off. At these prices, it kind of feels like strong-armed robbery. Save on titles like Deus Ex: Human Revolution Director’s Cut, System Shock I & II, Mirror’s Edge, Crysis, Far Cry 3: Blood Dragon, Frozen Synapse and Slave Zero. Hurry up and head over to grab your games now as this sale will not last forever. All prices are good until Friday March 17th at 10am PST. You can check out a list of the rest of the available titles at the Steam Cyberpunk Sale page.